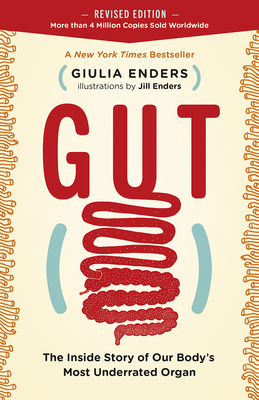 In this updated edition of a worldwide bestseller, Giulia Enders reveals the secrets and science of the digestive system--including new research on the connection between the gut and the brain. For too long, the gut has been the body's most ignored and least appreciated organ. But it does more than just dirty work; our gut is at the core of who we are. With quirky charm, science star and medical doctor Giulia Enders explains the gut's magic, answering questions like: Why does acid reflux happen? What's really up with gluten and lactose intolerance? How does the gut affect obesity and mood? A new section on the brain-gut axis dives into groundbreaking discoveries of psychobiotics - microbes with psychological effects that can influence conditions like depression and even stress. Aided with cheerful illustrations by Enders's sister Jill, this beguiling manifesto will make you finally listen to those butterflies in your stomach: they're trying to tell you something important. Giulia Enders, MD is a resident doctor for Internal Medicine and Gastroenterology and a two-time scholarship winner of the Wilhelm and Else Heraeus Foundation. She lives in Mannheim and Frankfurt, Germany. Jill Enders is a graphic designer whose main focus is communication in science, and the founder of a collaborative network of designers and scientists. David Shaw was born in Leeds, UK. He has worked at Deutsche Welle, Germany's international news broadcaster since 1995. Shaw has an M.A. from the University of Bath in Interpreting and Translating German and Russian, where his thesis was on the adaptation of German Television news texts for an international, English speaking audience. He regularly translates books from German to English.